Don’t want to spend a lot of money on an instrument until you know you’re going to stick with it? Find the best electric guitars under $500 right here. Fast action and pro-level sound with a lot of warmth and resonance. Elegant design and consistent intonation. Elegant appearance and powerful sound. The distinctive bright tone and smooth response make it a joy to play. Solidly constructed with the ideal sound for rock. The body shape of an electric guitar is mostly a matter of aesthetics. The exception to this is the area around the upper frets. How the body is cut in this area can affect how easy it is to reach these notes. Guitars are impressively upgradable. You can replace pretty much any part of them that’s made of metal down the line if you want to. If you love a particular guitar but aren’t a fan of the pickups, or you want a different bridge, that doesn’t have to be a deal breaker. Upgrading the hardware adds to the ultimate cost but you’ll still end up spending less than you would on a high-end instrument. The type of wood used for the body on an electric guitar won’t impact the tone as much as it would on an acoustic instrument, but it will still add its own color to the sound. Each tonewood has its own qualities and characteristics. Generally, denser wood will produce a brighter, more focused sound, while softer woods give you a mellower tone with more warmth. 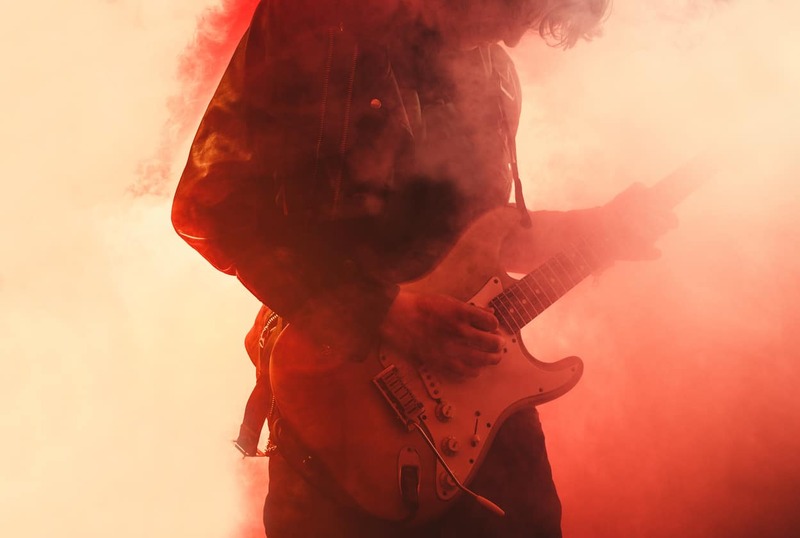 There's a reason you’re shopping for the best electric guitars under $500 and you know finding a quality instrument in that price range can be a bit tricky. Maybe you’re just starting to get into music and don’t want to spend a whole lot of money on an instrument until you know whether you’re going to stick with it in the long term. You’re a professional musician who needs an inexpensive backup instrument for gigs at rowdy venues you’d rather not take your main guitar into. Pretty much every guitar you find in this price range will be considered an entry-level instrument. Just because that’s what it’s labeled, though, doesn’t mean it won’t sound good enough to play on stage. In fact, as you’ll see from the list below, there are quite a few options that are suitable for players of all ages and playing levels. We’ve hand-picked nine of our favorite affordable electric guitars. Check out the full reviews below to help you pick the one that’s right for you. There are two brands that you’ll see over and over when you’re looking for affordable guitars: Epiphone and Squier. The low-cost versions of well-known guitar models put out by these companies are a great place to start looking. But they’re certainly not your only option. 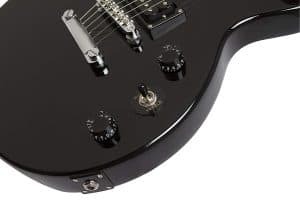 Buying a guitar from a reputable brand—like any of those that are featured on the list above—is the best way to make sure you still get an instrument that’s playable and durable when you’re looking at a lower price point. 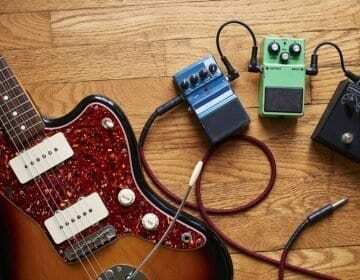 When you’re buying a low-cost instrument, there are a few things you should keep in mind. Even the best electric guitar under 500 dollars will not be able to stand up, sound-wise, against more expensive instruments right out of the box. 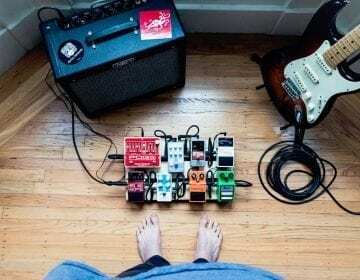 You can make adjustments to turn a cheap guitar into a monster, however, by upgrading things like the strings, pickups, and even hardware like the bridge and tuners. This doesn’t mean you can’t use the hardware or pickups that come installed on a cheap guitar; they’re perfectly functional for beginners, or as practice instruments. It does give you some adjustment options, though, if you want to tweak the sound and feel of your instrument. When you’re buying a new guitar, you want to pay the most attention to the parts you can’t upgrade. Make sure the body is well-constructed. The neck should be straight and firmly attached, with no wiggling. You also want to make sure the frets are even and smooth, and that the strings are straight with even tension. The pickups on an electric guitar are one of the main factors responsible for their sound. There are two broad categories of pickups that you’ll find on this list: single-coil and humbuckers. Single-coil pickups are wired differently from humbuckers, so when you’re looking for new pickups, you’ll want to match the type that originally came on your instrument. Changing types requires costly rewiring that’s just not worth it for an instrument in this price range. Both single-coil pickups and humbuckers have a wire wrapped around a pin which interacts with the magnet, producing the sound. The difference is a single-coil pickup has one, while a humbucker has two. This produces a different effect, as you can see from the chart below. And lastly, you’re going to need a guitar tuner to make sure you’re getting the most from your new axe. You can read our full reviews on the best guitar tuners to help you make the best purchase–check it out, here. People who play Yamaha instruments love them for their consistency. No matter what price level you’re buying at, you can count on them for craftsmanship and build quality. This precision definitely shines through in the Yamaha RevStar. You’ll see the Yamaha RevStar is different the moment you look at it. The unique body shape gives you the upper fret access of a double cutaway but with a more elegant contour. With over a dozen color options, you can really be proud to show this baby off on stage. The sound is as bold and powerful as the design. It’s full in the mid-range with impressive overtones. Yamaha designed these VH3 humbuckers to complement the combination of Nato and maple used in the RevStar. They’re custom-wound with Alnico V magnets and German silver baseplates. There’s also a dry switch that filters your tone so it sounds more like a single-coil pickup, giving you a brighter tone without sacrificing quality. The RevStar also gets high marks for player comfort. The back of the guitar is contoured so it rests more naturally against your body. The neck is also fairly thin so you won’t have to stretch or strain your fingers. The frets are smooth and consistently well-finished, letting you play fast without losing note definition. If you’re looking for something that screams cool—or even just one that straight up screams—the RevStar is the best electric guitar under 500 dollars. It gives you lots of raw power that translates to killer overdrive, and the custom hardware and electronics outperform what you’ll find on guitars at twice the price. 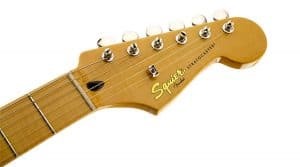 Squier is to Fender as Epiphone is to Gibson: the low-cost equivalent that gives you the quality the brand is known for without the high price tag. This one is designed to mimic the look and vibe of the classic “blackguard” Telecasters from the ‘50s. It’s a great way to get vintage styling with all the convenience of modern electronics. Most entry-level guitars use medium frets, but the frets on the Squier ‘50s Telecaster are a bit larger. 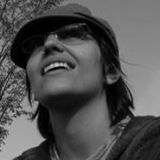 This is great for genres like rock and country that call for bends and other effects. The neck is one of the places you can really see the blending of vintage and modern in this instrument. It has a classic 21-fret tint gloss look but an updated 9.5” radius that makes it a lot faster to play than old-school Telecasters. Tone-wise, you’ll love this instrument’s powerful response and front-end bite. The pine used for the body resonates similarly to the ash traditionally used for Telecaster, with a sound that harkens back to early Esquire instruments that used similar tonewoods. The single-coil Alnico 5 pickups are really what gives the instrument its distinctive Telecaster sound, however. You’ll get impressive clarity and definition on every note, regardless of how much distortion you like to play with. Telecasters are seen most often in pop and rock, but this guitar isn’t limited to any one genre. It strikes a great balance between mid-range depth and high-end sparkle and has enough tonal flexibility that you can play pretty much anything you have a mind to—and have it sound great. Epiphone is a company you definitely want to keep your eye on when you’re shopping for affordable electric guitars. It’s the “budget branch” of the Gibson company. While they go by a different name, they give you the same design aesthetic and appreciation for quality, which they guarantee with a lifetime warranty. This is an excellent choice for a beginning player. Not only because it’s affordable but also because it’s very reliable. The fixed Tune-o-matic bridge is designed to keep your instrument better in tune for longer, great news if you’re just learning how to play. These same characteristics make it great as a backup instrument for pros, as well, since you can count on it to hold up to the rigors of gigs and travel. The body and neck on this guitar are solid mahogany, with a rosewood fingerboard—a classic combination of tonewoods that gives this guitar a traditional tone. It’s not the most complex or unique sonic texture out there, but it is one of the more versatile options you’ll find, with a tone that’s suitable for a wide range of different styles and genres. The Les Paul Special-II comes with open-coil humbucker pickups at the neck and bridge. The electronics overall are hot and give you a sensitive, responsive tone, with no extra noise regardless of your dynamic level. It also comes with 500k pots for the volume and tone with a three-way toggle for choosing between the pickups. This is one of the best-known guitar models for a reason. It certainly doesn’t sound cheap, with the rich sustain and quality sound you’d expect from a Gibson for only a fraction of the price. The Fender Stratocaster is another iconic guitar design, so well-known that even people who have never played an instrument know about the Strat. What you might not know, however, is how this model differs from the Telecaster above—especially considering they’re the same price and very similar in terms of both their history and their appearance. But don't rush to conclusions. There are slight differences in the design of these two instruments. The Strat headstock is larger. 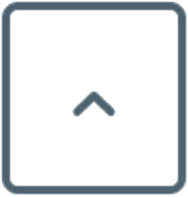 That added weight lengthens and deepens the sustain. 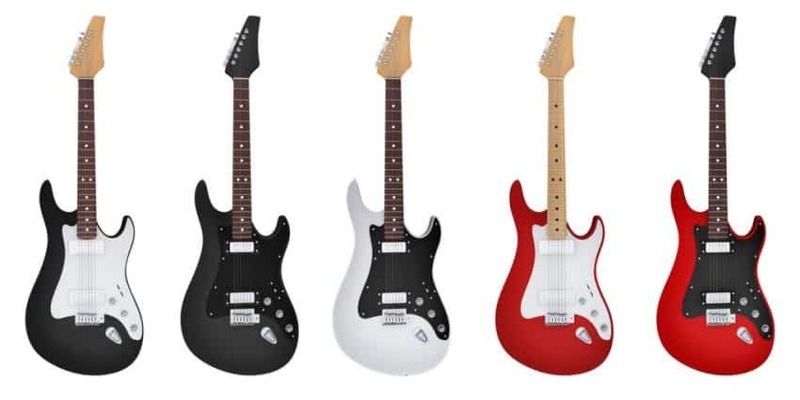 The Strat also features a double cutaway design, as opposed to the Telecaster’s single cutaway, which can make it easier to reach the upper frets—especially for those fast solo lines. You’ll also notice a difference in the electronics. The Stratocaster uses three pickups with a 5-way position switch, giving you more options when it comes to customizing your tone. While both use a single-coil pickup, the use of Alnico III magnets in the Stratocaster gives it a softer, more nuanced tone, as opposed to the raw power of a Tele. Perhaps the most distinctive thing about a Stratocaster, though, is the hardware. It uses a six-saddle tremolo bridge that includes a whammy bar for wide pitch bends and variations. 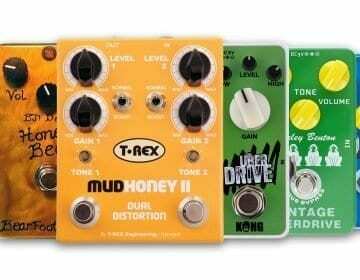 This makes it great for players who like to add more effects to their tone, especially players in the rock and funk genres. 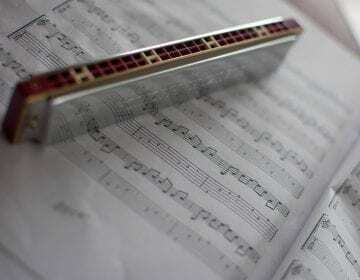 All of the hardware is made of high-quality chrome for durability and long-lasting intonation. While they’re best-known as a great brand for beginners, also makes instruments that you could consider to be in the mid-range or intermediate price-point, like this Les Paul Standard. It brings you the same design aesthetic and craftsmanship but takes the quality of the materials up a notch over their entry-level options, making it a popular choice as a backup guitar for professionals. 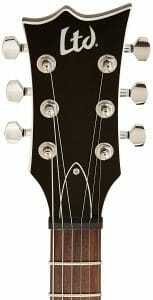 The profile of the Gibson Les Paul is the classic look most people think of when they think about electric guitars. With the classic white pickguard, narrow waist, and single cutaway design, the Les Paul Standard has an attractive vintage look that you’ll be proud to show off on stage. Even small details like the trapezoid inlays on the fretboard are designed to give you that classic rock look. The sound quality of a Les Paul Standard is noticeably higher than what you’ll get from other versions of the guitar. The headstock is designed to put more pressure on the nut, improving the sustain of the notes as well as smoothing out the intonation. The pickups on this model are also different from what you’ll find on other Epiphones. They use Alnico magnets for a warmer tone with more complex overtones. What a lot of players like the best about a Les Paul, though, is the feel of it. The slim neck and low action make it a very fast-playing guitar, perfect for shredding solos. This is also enhanced by the quality of the hardware, which not only makes it easier to play but also simplifies the tuning and changing of strings. If you’re looking for the best guitar under 500 bucks in terms of sound, the Les Paul Standard is an awesome choice. ESP isn’t as well-known a brand as Fender or Gibson, but if you’re in the market for an affordable guitar it’s definitely a brand worth checking out. Across their product line, they provide high quality for a lower cost. With the Amazon Exclusive EC100AT, they push the value they offer to the next level, with fantastic sound and a sleek look. The profile of the EC100AT is a familiar single cutaway design, but if you turn it to the side you’ll see one way it’s unique. It uses an arch top, a feature you’d find on higher-end electric guitars. This improves the resonance and tone quality across the range. The waist also narrows further on the back than on the front so it’s more comfortable to play. This is also a very responsive guitar with a high dynamic potential. The pickups have designated volume controls, with a master tone control to further adjust your sound. This tonal versatility makes it especially great for a beginner on a budget who isn’t quite sure yet what style of music they want to play. Another thing that makes this model great for beginners is its ease of use. It’s quick to tune and stays in tune well, unlike some super-budget options. Some players also find the larger frets and robust neck easier to play, since you won’t have to press quite as hard to make the notes sound. 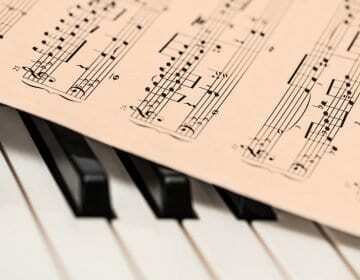 The notes will be more likely to go out of tune. The neck is also on the wider side, so it’s not the best choice for players with small hands. The Les Paul Studio falls in between the Special and the Standard, both in terms of price and material quality. The Goth Les Paul, meanwhile, features a black satin finish and black chrome hardware, for a look that’s just as powerful as the sound. The black chrome hardware doesn’t just look great, either. It keeps your instrument perfectly in tune while you’re playing, and it’s easy to adjust and change the strings. Pressing on the master tone knob activates the kill switch. Like other mid- and high-end Les Pauls, it has two knobs each for the tone and volume for more detailed adjustment. Alnico 5 magnets are the most powerful of the common pickup materials. They give the Les Paul Studio a huge bold sound with an absolutely killer sustain, especially when you’re playing clean. The combination of Alnico humbuckers and mahogany construction gives you a full, warm, and resonant tone, with absolutely no buzzing or pickup hum. The Studio version of the Les Paul was originally designed to be a lighter, more streamlined version of the instrument aimed at studio musicians looking for an instrument that’s easy to play and still sounds great. Since it’s one of the lightest instruments on this list, it’s perfect for younger players, players with back problems, and professionals who just want an option that’s easier to carry to gigs. 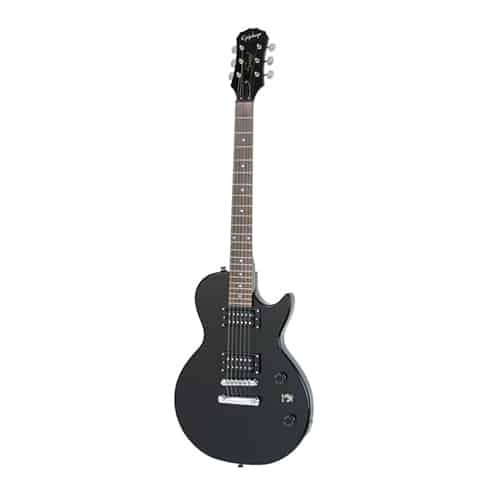 The Les Paul Studio is the best electric guitar under 500 dollars if you want an instrument that looks as good as it sounds, and is easy on both your body and your budget. Paired with the right amp, it can really scream, too, especially when you push it into overdrive. If you’re looking for the most unique guitar on the list, the Gretsch Pro Jet is a strong contender. From headstock to the tailpiece, it has features you won’t find on most (or any) of the other options in the price range. 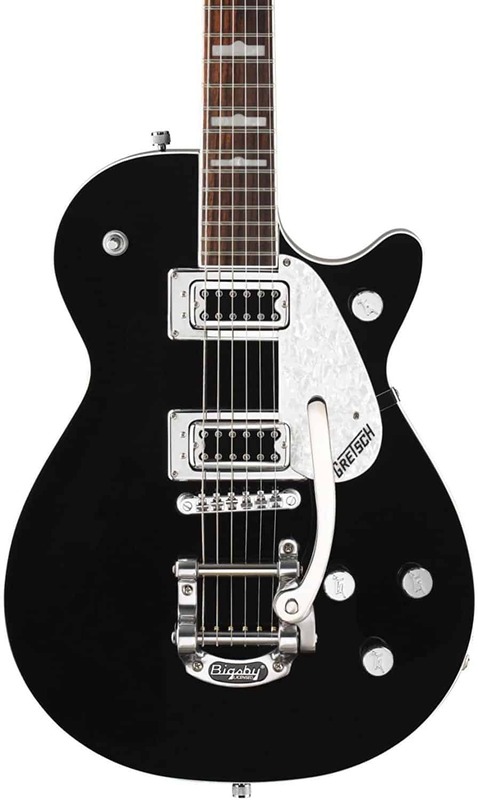 Fans of Gretsch guitars love the brand’s distinctive sound. The Pro Jet uses Filter’Tron humbuckers for a rich tone with a lot of overdrive power. The sound is definitely on the brighter side, especially for a humbucker. If you prefer a biting guitar tone but don’t want any extra noise, you’ll especially appreciate the Filter’Tron pickups. The construction contributes to the tone too. The combination of the archtop with the chambered body greatly enhances the resonance, letting you get more of that Basswood mahogany warmth into your tone. The maple top balances the tone so it doesn’t get too heavy. The end result is a full tone with lots of high-end shimmer. The Pro Jet is also just a blast to play. The neck is pretty quick, and the solid hardware makes it highly responsive across the strings. And of course, there’s the tailpiece and the option of a whammy bar for those extra bends and effects. It is on the higher end of the budget spectrum, but for players in jazz, blues, and similar genres, that extra couple hundred bucks you’ll spend on this over an LP-Special, for example, is well worth it. 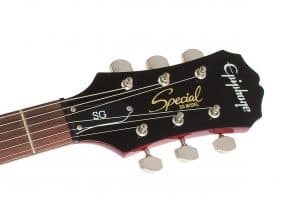 Another great affordable option from Epiphone is the SG-Special. It costs a bit more than the Les Paul Special II, but it’s worth it if you’re looking for a screaming rock tone with powerful overdrive in the under $200 range. 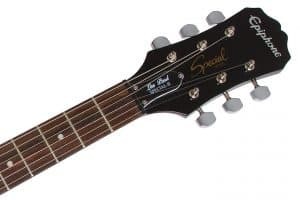 In terms of the electronics and hardware, the SG-Special is very similar to the Les Paul special. It uses the same humbucking pickups and tone pot. It also includes an integrated kill switch, which you can activate just by pushing in on the master tone knob. It also comes with the Tune-o-matic bridge and Stopbar tailpiece for precise control over your intonation. Where the SG-Special differs from the Les Paul Special is primarily in the shape and construction of the guitar itself. The body uses a double cutaway design which both gives it the iconic classic rock look and makes it easier to play the upper frets. The tonewoods used in both the neck and body are also different, which is what makes it a better choice specifically for rock musicians since it has a bright, full sound that holds its tone when you push the gain. Like other Epiphone guitars, you can count on the SG-Special to be well-built and long-lasting despite its incredibly low price tag. From the bolt-on neck joint to the wiring of the pickups, every detail is designed to be easy for a beginner to sound good playing. It’s also a very playable guitar. The medium-sized frets are easy on the fingertips, and the action is set comfortably right out of the box. When you’re shopping within a given brand (like comparing Epiphones to each other, for example) you can generally make an association between the relative price and the quality level. 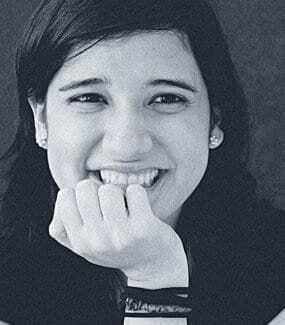 Between brands, though, there’s not always a direct correlation between price and value. You’ll be better served to pay attention to the materials used for the body, hardware, and pickups than by looking at the price tag, especially within the category of affordable instruments. 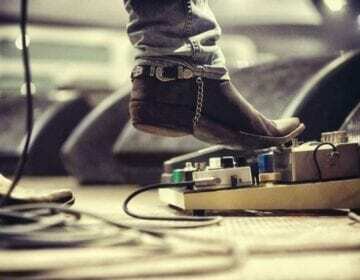 You can also use different pedals such as a volume pedal or even a guitar compressor to help manipulate the sound of your guitar. 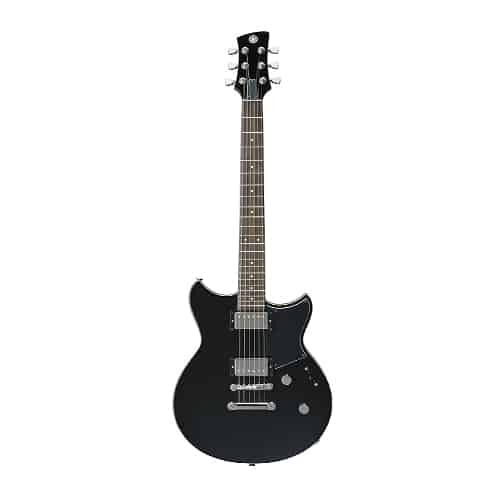 If pressed to pick just one option as the best electric guitar under $500, we have to go with the Yamaha RevStar. It scores the highest on important points like build consistency, tone quality, and playability. In terms of both the look and the sound, it’s a step above most entry-level instruments and is one of the few affordable guitars that even a professional musician would call stage ready. With this option, you’re getting a trusted brand name and the quality that comes with it at a price that won’t break the bank. Beginner players will especially love the feature that helps keep the guitar in tune longer. Don’t pass this guitar up! If you’re still not sure which one you want to buy, your best bet is to pay a visit to a music store. Play around on a few models, and listen to a few more. You can figure out what you want in the store then buy it online to get the better price—and don’t forget to drop us a line in the comments to tell us which one you picked. If I want to replace the strings, what kind should I buy? There are a lot of different types and brands of strings that will work on electric guitars. The specific string gauges that you need will depend on the instrument. If you’re new to guitar and not sure where to start, popular string brands include Fender, Ernie Ball, and D’Addario. Do these guitars come with an amp? The versions linked to here do not—one of the reasons they’re priced so affordably. If you don’t have an amp already, you’ll want to budget around an extra $100-$150 to buy one, so work that into your calculations when you’re shopping. What other accessories will I need to get started? 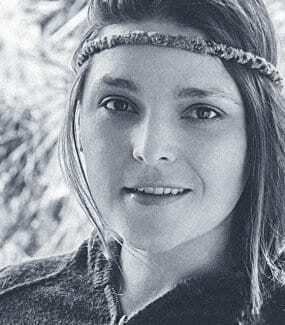 The only other thing you’ll absolutely need is an amp and a cord to connect it to the guitar. Most amps come with a cord, but they’re cheap if it doesn’t (around $5-$10). Beyond this, the main accessories guitarists buy are upgrades of included components like the strings and shoulder strap.